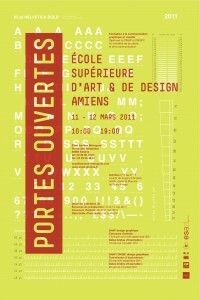 On the 8th of February 2011, the latest post-diplôme of the ESAD in Amiens finished its one-year-and-a-bit long cycle of studies, practice and research. Under the scrutiny of the invited external jurors Jo de Baerdemaeker and Olivier Nineuil, the two students Alisa Nowak and Damien Collot presented the results of their stay at the ESAD. The two are the first students graduating from Amiens since my full involvement in the teaching at this school, and self-evidently this class has a particular personal meaning for me. 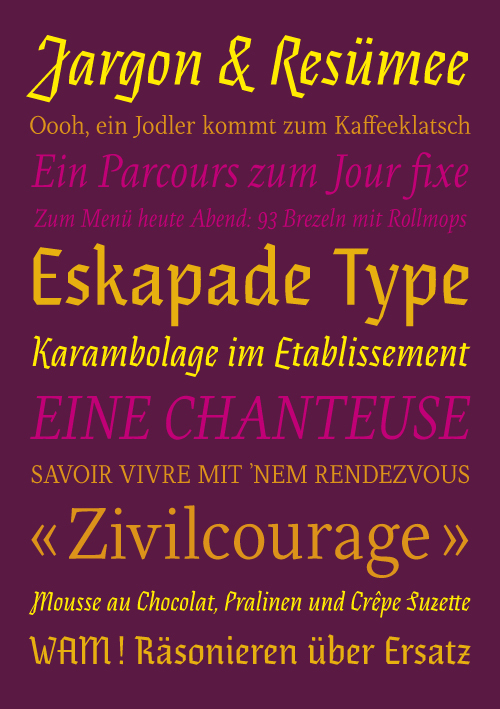 But more than this, I would go as far as saying that the work they have produced under the combined supervision of my colleagues Patrick Doan, Sébastien Morlighem and myself is a promising starting point for their careers in type. Alisa and Damien both have shown ingenuity, curiosity, skill and perseverance in their respective approaches that created two very distinct, yet similarly qualitative projects. It makes me very happy and even a little proud to have played a role in their first serious steps in type design — and it would surprise me if they were the last thing we were going to see from them. Good luck for the way ahead! Coincidentally, the school is having its open days this very week, welcoming prospective students, curious guests, colleagues and friends to have a first-hand look at the work done at the ESAD Amiens. Les portes sont ouvertes du 11 à 12 mars, 10—19h, soyez le bienvenu. The following images give some impressions from the jury meeting and shed a first glance at Alisa’s and Damien’s work, explained and illustrated in more detail in the below PDFs.